7 Primitive Placemats. 3 are Brand New and 4 have been used very little. Front is pieced together with red green and tan material and back is red and tan checked. Very cute for more of a country design. Comes from a smoke free animal free home. Egg Shaped Placemat. 2 Blue with White. Set of Three (3). They are 13.5" x 19". I also have a lot of six matching napkins listed. 2 Gingerbread & Candy Cane Placemat. 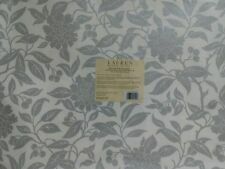 18" L x 13" W.
Williams Sonoma Set of 6 Place Mats Floral Design 18" x 14"
EXCELLENT PRE-OWNED CONDITION - HARDLY USED! 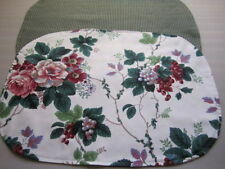 Williams-Sonoma Set of Six Floral Placemats, Size 18"x14". Set a stylish foundation for each table setting with Saro Lifestyle's Chunky Woven Placemat featuring rich texture and a bright hue - (Set of 4 pieces). Pampepato collection Materials: 100% cotton Product care: Hand wash Color: Red Size: 14 inches wide x 20 inches long A smart and stylish hostess gift that she'll use again and again Textured ridges give your table a little something extra. 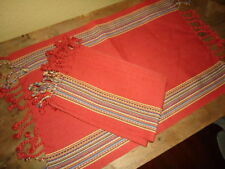 Set of 3 Threshold Placemats. -Christmas Village House. -pocket ( for utensils). The versatile solid color is nuanced by a classic mattor ribbed weave creating subtle tonal variation for a contemporary striated effect to compliment any place setting. Franboler Collection Size: 13 inches wide x 19 inches long Fiber content: 100-percent cotton Product care: Machine washable, air dy flat Setting size: Sold in a set of 4 pieces Solid color with subtle texture is perfect for everyday use. This MUG RUg, SNACK MAT, or HOT MAT is appx. 11 1/2" X 9”. These can be used as HOT MATS, because there are 4 layers of protection from heat. A layer of fleece and alayer of INSUL-BRIGHT which reflects heat away from you. 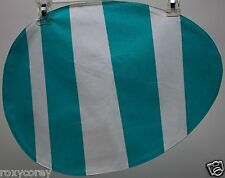 With a stylish striped border, this linen-cotton placemat from Saro Lifestyle boasts a clean and classic design ideal for any dining occasion.Classic stripes and a linen-cotton construction will bring a sense of natural simplicity to each place setting20 inches long x 14 inches wide60-percent cotton, 30-percent polyester, 10-percent linenPattern: StripeCare Instruction: Machine WashShape: OblongType: PlacematsSet Size: Set of 4Color: Tan. Quilted PlacematGather around the table surrounded by family, friends, and charming cotton placemats from C&F Home. Reversible for extra styling options, you are free to mix and match for a customized look. Stains and spills? No problem. These placemats are machine washable for easy care.Handcrafted Quilted Placemats with Scallop EdgeTraditionalReverses from floral pattern to coordinating traditional patternPre-Washed and Pre-Shrunk. Double sided as shown in second picture. Set of 4 Old Fashioned Santa Christmas Placemats Handmade 100% Cotton 16"x 12"
Lot/Set of 4 Old Fashioned Christmas Placemats. 100% Cotton. Each is 16" long x 12" tall. Greenback, with multicolor print on the face. Bring the feeling of Fall to your dining table with this placemat set from Saro Lifestyle, colorfully patterned with a festive foliage design. Feuillage collection Color: multi Dimensions: 13 inches wide x 19 inches long Set of 4 pcs Fiber content: 100-percent cotton Product care: hand wash.
Rustic Woven Cotton Placemats (Set of 4) - 14"x20"
Ever step into someone's home and admire their décor? What about their placemats? These dining table placemats definitely will be admired. These rug-like inspired, oblong-shaped, made from 100% cotton, placemats, feature tassels that give them an added flair. They have an unsaid eclectic feel with a touch of hippie and ethnic inspiration. Size: 20 inches wide x 14 inches long Fiber: 100% cotton Care: delicate machine wash, no bleach, don't tumble dry, med iron Set of 4 pcs Comes in a set of four, these rug placemats are great for entertaining and daily usage. A placemat also helps protect your table against spills, food debris and heavy dinnerware. Reindeer And Tree Design Cotton Table Placemats (Set of 4) - 13"x19"
Aside from the tree and presents, Christmas dinner is a special time of year. It's when we gather with our loved ones for a god time and a heartwarming meal. That memorable meal can be eaten using these Christmas placemats. Made from 100% cotton, these oblong-shaped, charming reindeer and tree placemats are quite inviting. They also feature some snowflakes as well. They speak Christmas with enchantment and subtly. Size: 19 inches wide x 13 inches longMaterials: 100% cottonProduct care: Cool hand wash, line dry, med ironDining table placemats not only look nice, but they help protect your table from any potential damage due to heavy dinnerware.Come in a set of four, these placemats complement an assortment of decoration styles.Set of 4 pcs. For sale I have 4 beautiful hand knitted/ crocheted place mats. I value your opinion greatly, and will make every effort to earn your loyalty. 17 1/2" x 11". This is a food grade silicone table mat. It is non-sitcky but its friction is strong, so it won't slide easily on the table. It can be used as placemats, coasters, potholders and heat pads on dining tables, tea tables. Handwoven 100% cotton made in India. Approx 19" x 13". Color: Multi. Pattern: Multi. Shape: Oblong. Condition: Like New, Gently Worn. Handwoven 100% cotton made in India. Approx 19" x 13". You may also be interested in. Plaid & Fringe Trimmed Cotton Table Placemats (Set of 4) - 14"x20"
When it comes to plaid, you think of the preppy look, that being of wealth and prestige. 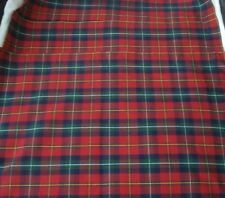 Plaid can also be outlandish, too, but not in this case. These dining table placemats are definite showstoppers. 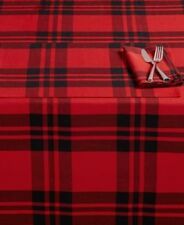 Made from 100% cotton, these oblong-shaped, plaid placemats spice up any table. They're bold, but not obnoxious, and the fringe detail is the icing on the cake. Size: 20 inches wide x 14 inches long Fiber: 100% cotton Care: delicate machine wash, no bleach, don't tumble dry, med iron Set of 4 pcs Comes in the perfect set of four, which is great for your daily dining needs and for a quaint dinner party. Placemats come in handy when it comes to protecting your table from any kind of damage, especially from heavy dinnerware. Williams Sonoma Set of 4 French Yellow Cotton Napkins 17"x16"
EXCELLENT PRE-OWNED CONDITION! Size: 17"x16". Crate & Barrel Robyn Embroidered Placemats. I have two placemats that are previously used. 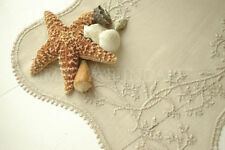 Material:100% Cotton: beautiful hand-made crochet with ribbon embroidered design placemats. Color: Beige. Set of 4 Pcs. Imported; Machine wash,iron on the lowest setting if needed ,Matching placemat, table topper, table runner and tablecloth available. You are looking at a new set of 4 placemats from Sur La Table. Purple ombré striped. Oblong 14” x 20”. Leaves, acorns and pine cones pictured on these. NEW placemats in the Wildlife Trail design. From Park Designs. Colors are shades of green and brown on a soft beige background. 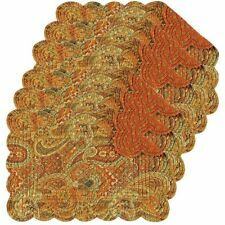 location 3 jl 17-h.
Reversible~Target~Threshold~Set Of 4~ Coral~Tan~Woven Placemats~NWT~14"x19"
4 SETs, including 4 pieces of 12" 18" placemats& 4 pieces of 16" 16" napkins, white, decorated by handmade battenburg lace. China, hand embroidery is traditional while drawnwork techniques (including battenburg lace, Italian de point lace, reticella lace, crochet lace, bobbin lace, tatting lace, etc) were mainly introduced by missionaries, who were mostly active in the cities near the ocean, in. Handcrafted 100% cotton quilted placemat with hand guided stitching. Quilted Placemat. Reversible for extra styling options, you are free to mix and match for a customized look. Stains and spills?. No problem. Cotton Table Mats With Picnic Plaid Pattern (Set of 4) - 13"x19"
You have your everyday run-of-the-mill type of placemats and then you have these spunky-looking plaid placemats. The plaid pattern gives them a prestigious flair, yet on the flipside, the bright and airy monochrome color scheme gives them a cheerful and wholesome look. Either way, they look great. Made from 100% cotton, these picnic plaid placemats are oblong-shaped, and they're essential for your table setting. Size: 19 inches wide x 13 inches longMaterials: 100% cottonProduct care: Cold machine washPlacemats act as protection against dents, heat, water stains and spills.These preppy placemats fit an array of decoration styles, and come in a set of four.Set of 4 pcs. Made in the U.S.A. By Audrey in Dallas. The design is a cobalt blue and cream with multi colored fruit and floral overlapping designs. The placemats are 13” x 17.5” and are rectangular with the corners beveled (kind of like an elongated stop sign). Quilted PlacematGather around the table surrounded by family, friends, and charming cotton placemats from C&F Home. Reversible for extra styling options, you are free to mix and match for a customized look. Stains and spills? No problem. These placemats are machine washable for easy care.Handcrafted Quilted Placemats with Scallop EdgeTraditional ToileReverses from floral to coordinating stripePre-Washed and Pre-Shrunk. This is a set of 8 placemats by SUZANNE in shades of ivory, rose and blue in a marbling, granite type pattern. 100% cotton, machine washable, tumble dry. 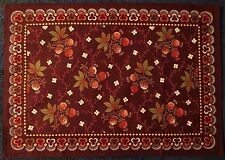 Set of Two Cotton Placemats Red Apples Reversible Patchwork Print. One side is dark blue with red apples, other is patchwork. Never used. Here are six new placemats in a fruit and veggie pattern. They are 100% cotton, hand woven in India. 4 yellow Napkins. Fruit & Flowers. Yellow/ Green. 4 Table Mats. This MUG RUg, SNACK MAT, or HOT MAT is appx. 10" X 10”. We do have a wee Yorkie puppy, non-allergic. (4) Black & Golden Orange Fabric Placemats New 17.5" x 11.5"
4 New Matching Placemats. Fabric in black with golden orange print.